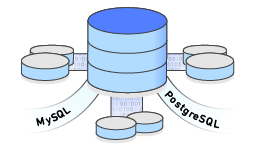 Last year we announced that we would be bringing PostgreSQL compatibility to Amazon Aurora. At that time I invited you to sign up for our private preview so that you could take a closer look. The response to that request was strong! Our customers already understood that Amazon Aurora would provide them with high availability and high durability, and were looking forward to running their PostgreSQL 9.6 applications in the AWS Cloud. Today we are opening up the preview of Amazon Aurora with PostgreSQL Compatibility to all interested customers and you can sign up today. The preview runs in the US East (Northern Virginia) Region and delivers two to three times the performance of PostgreSQL running in traditional environments. It also supports quick, easy creation of fast, low-latency read replicas. I’m in catch-up mode again, and would like to tell you about some recent improvements that we have made to Amazon Aurora. 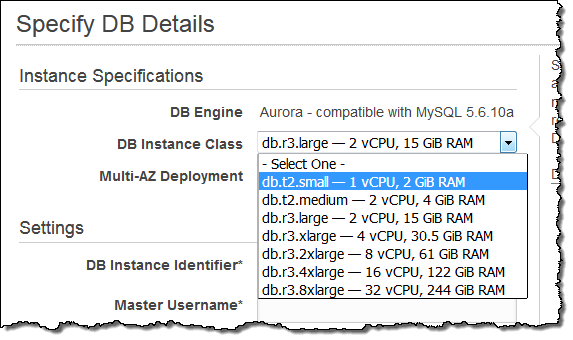 As a reminder, Aurora is our high-performance MySQL-compatible (and soon PostgreSQL-compatible) enterprise-class database (read Now Available – Amazon Aurora and Amazon Aurora – New Cost-Effective MySQL-Compatible Database Engine for Amazon RDS for an introduction). Let’s take a quick look at each one! You can also choose to encrypt the snapshot as part of this operation. To learn more, read Copying a DB Snapshot or DB Cluster Snapshot. The destination region must include a DB Subnet Group that encompasses 2 or more Availability Zones. 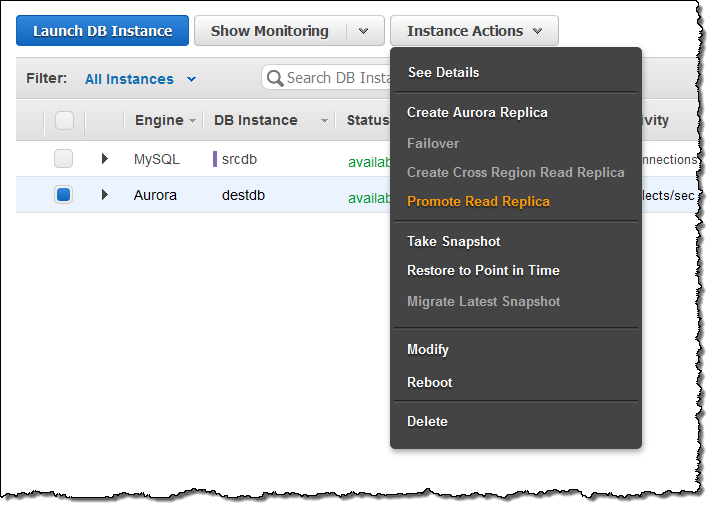 To learn more about this powerful new feature, read Replicating Amazon Aurora DB Clusters Across AWS Regions. If the DB Instance is encrypted, the snapshot will be as well. You will also need to share the key that was used to encrypt the snapshot. 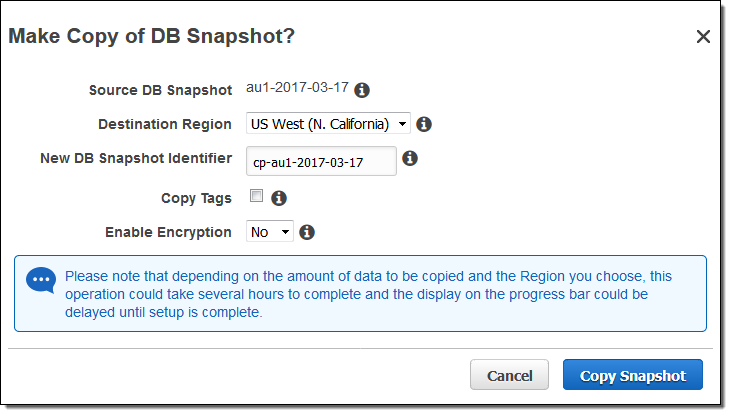 To learn more about this feature, read Sharing a DB Snapshot or DB Cluster Snapshot. See the Amazon Aurora Pricing page for pricing info in each region. These economical instances are a great fit for dev & test environments and for light production workloads. You can also use them to gain some experience with Amazon Aurora. These instances (along with six others, including the t2.medium that we launched last November) are available in all AWS regions where Aurora is available. On-Demand pricing for t2.small DB Instances starts at $0.041 per hour in the US East (Northern Virginia) Region, dropping to $0.018 per hour for an All Upfront Reserved Instance with a 3 year term (see the Amazon Aurora Pricing page for more info). Relational databases are at the heart of many types of applications. In order to allow our customers to build applications that are highly available, RDS has offered multi-AZ support since early 2010 (read Amazon RDS – Multi-AZ Deployments For Enhanced Availability & Reliability for more info). Instead of spending weeks setting up multiple instances, arranging for replication, writing scripts to detect network, instance, & network issues, making failover decisions, and bringing a new secondary instance online, you simply opt for Multi-AZ Deployment when you create the Database Instance. RDS also makes it easy for you to create cross-region read replicas. Amazon RDS for MariaDB now covered by RDS SLA. Amazon RDS adds Multi-AZ support for SQL Server in Asia Pacific (Seoul) AWS Region. Amazon RDS for PostgreSQL now supports cross-region read replicas. Amazon RDS for PostgreSQL now supports logical replication. Amazon RDS now supports read replicas of encrypted database instances across regions. Additional Failover Control for Amazon Aurora. 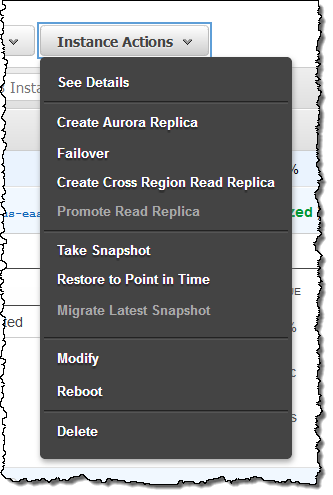 Cross-Region Read Replicas for Amazon Aurora. Amazon RDS now supports copying encrypted snapshots of encrypted DB instances across regions. Amazon RDS for SQL Server supports SQL Server Native Backup/Restore with S3. 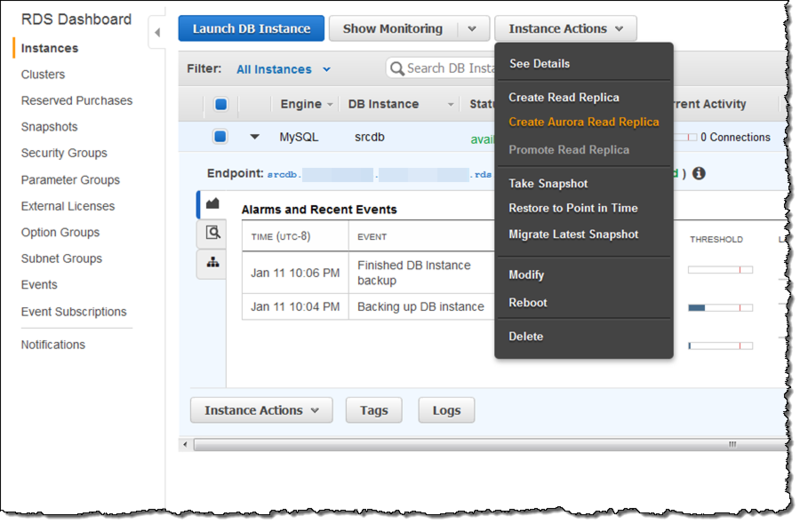 Enhanced Monitoring for Amazon RDS now available for MySQL 5.5. RDS Enhanced Monitoring is now available in Asia Pacific (Seoul). Amazon RDS Enhanced Monitoring is now available in South America (Sao Paulo) and China (Beijing). 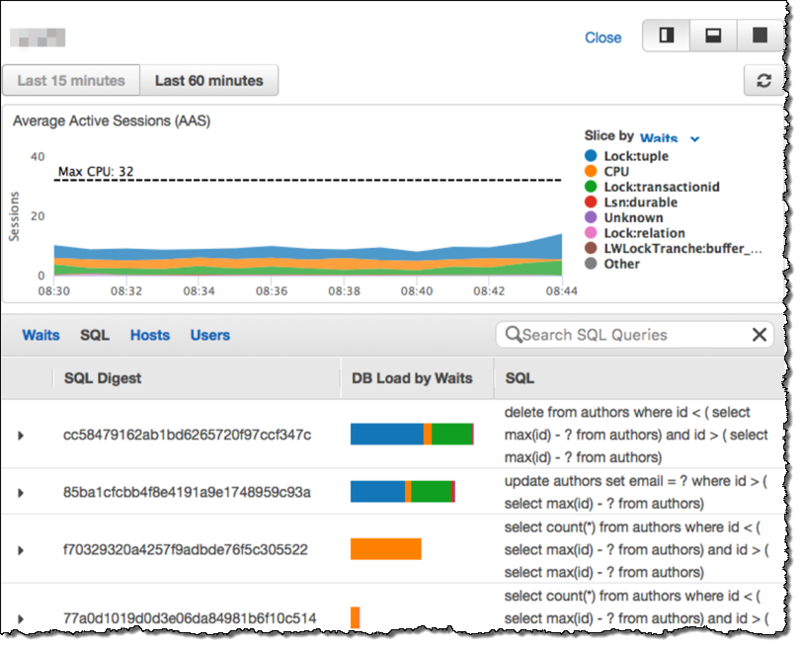 Enhanced Monitoring is now available for Amazon RDS for Oracle. Enhanced Monitoring and option to enforce SSL connections is now available for Amazon RDS for PostgreSQL. Enhanced Monitoring for SQL Server. MariaDB audit plug-in now available for RDS MySQL and MariaDB. Amazon RDS for SQL Server supports Windows Authentication. Secure Sockets Layer (SSL) and Oracle Native Network Encryption (NNE) in all Amazon RDS for Oracle editions. Amazon RDS for Oracle now supports the Oracle Label Security (OLS) option. 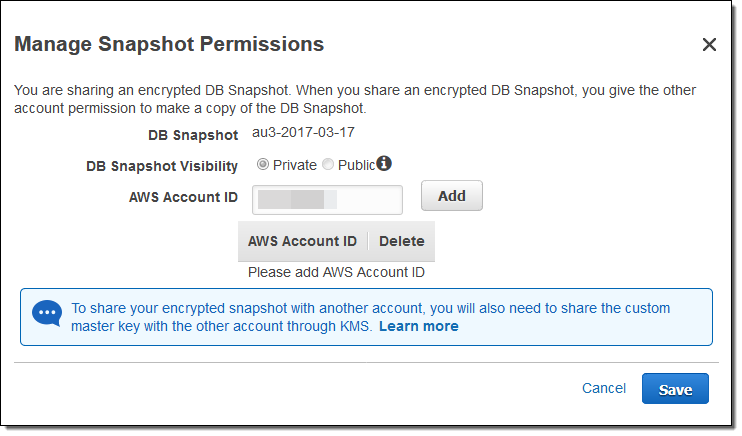 RDS now supports sharing encrypted database snapshots with other AWS accounts. 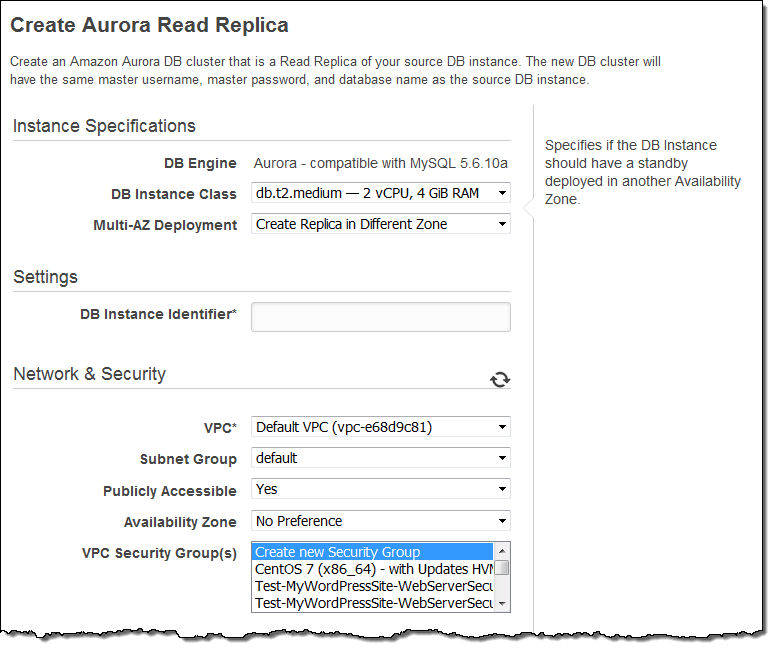 RDS now allows specifying the VPC for your Amazon RDS DB Instance. 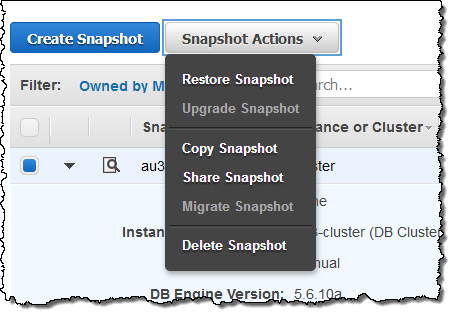 Cross-account snapshot sharing for Amazon Aurora. Easy migration from RDS MySQL to RDS MariaDB. Point-and-click upgrade from MySQL 5.6 to 5.7. Support for SQL Server 2008 R2 SP3 and SQL Server 2012 SP3. Support Microsoft SQL Server 2016. Outbound network access using custom DNS servers. January PSU patches, improved custom Oracle directories and read privileges support. Oracle Repository Creation Utility (RCU) and April PSU patches. 11g to 12c major version upgrade. Oracle Enterprise Manager (OEM) Cloud Control. License included offering for Oracle Standard Edition Two (SE2). Cluster creation from a MySQL Backup. Spatial indexing & zero-downtime patching. Efficient storage of binary logs. Lock compression, performance schema, hot row contention improvements, improved memory handling, and smart read selector. Support for PostgreSQL 9.5 with version 9.5.2, as well as minor versions 9.4.7 and 9.3.12. Support for new minor versions, logical replication, and usability as a source for AWS DMS. We’ve already made some big announcements this year (you can find them in the AWS What’s New for 2017) with plenty more in store including the recently announced PostgreSQL-compatible version of Aurora, so stay tuned! You may also want to subscribe to the AWS Database Blog for detailed posts that will show you how to get the most from RDS, Amazon Aurora, and Amazon ElastiCache. 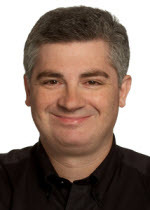 PS – This post does not include all of the enhancements that we made to AWS Database Migration Service or the Schema Conversion Tool last year. I’m working on another post on that topic. Migrating from one database engine to another can be tricky when the database is supporting an application or a web site that is running 24×7. Without the option to take the database offline, an approach that is based on replication is generally the best solution. 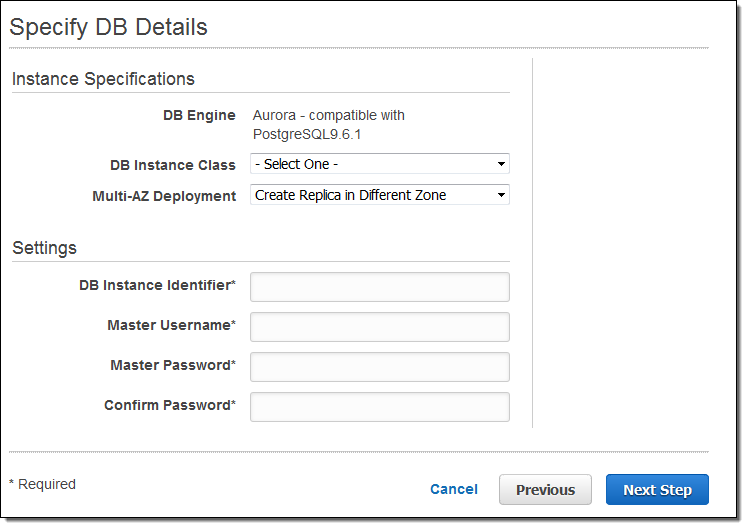 Today we are launching a new feature that allows you to migrate from an Amazon RDS DB Instance for MySQL to Amazon Aurora by creating an Aurora Read Replica. The migration process begins by creating a DB snapshot of the existing DB Instance and then using it as the basis for a fresh Aurora Read Replica. After the replica has been set up, replication is used to bring it up to date with respect to the source. Once the replication lag drops to 0, the replication is complete. At this point, you can make the Aurora Read Replica into a standalone Aurora DB cluster and point your client applications at it. Migration takes several hours per terabyte of data, and works for MySQL DB Instances of up to 6 terabytes. Replication runs somewhat faster for InnoDB tables than it does for MyISAM tables, and also benefits from the presence of uncompressed tables. If migration speed is a factor, you can improve it by moving your MyISAM tables to InnoDB tables and uncompressing any compressed tables. Instruct your application to use the cluster’s read and write endpoints, and you are good to go! Despite stiff competition from many other AWS services, Amazon Aurora is still the fastest-growing service in AWS history! Our customers love the speed, performance, and availability. They are making great use of the MySQL compatible side of Aurora today, and are looking forward to using the PostgreSQL compatible side in the future (read Amazon Aurora Update – PostgreSQL Compatibility to learn more and to see a list of other recent additions to Aurora). Today we are launching two features that were announced at AWS re:Invent: spatial indexing and zero-downtime patching. Amazon Aurora already allows you to use the GEOMETRY data type to represent points and areas on a sphere. You can create columns of this type and then use functions such as ST_Contains, ST_Crosses, and ST_Distance (and many others) to perform spatial queries. These queries are powerful, but can be inefficient to process at scale, limiting their usefulness for large data sets. In order to allow you to build large-scale, location-aware applications using Aurora, you can now create a specialized, highly-efficient index on your spatial data. Aurora uses a a dimensionally ordered space-filling curve (for you mathematical types) to make your retrievals fast, accurate, and scalable. The index uses a b-tree and delivers performance that is up to two orders of magnitude better than MySQL 5.7 (watch this segment of the Amazon Aurora Deep Dive video or review the presentation for details). You will need to enable Aurora Lab Mode in order to make use of this new feature. After you have done this, you can add spatial indexes to existing tables or create new tables that include spatial indexes (read Amazon Aurora and Spatial Data to learn more). In today’s 24×7 world, there’s never a good time to take a database offline for patches and other updates. Although it is possible to maintain high availability by using read replicas and promotion, there’s always room to do better. Our new zero-downtime patching feature allows Aurora instances to be updated in place, with no downtime and no affect on availability. This feature works with instances that are running the current (1.10) version of Aurora, and works on a best-effort basis. It works for both single node clusters and for the writer instance in multi-node clusters, but cannot function if binary logging is active. The patching mechanism pauses while waiting for open SSL connections, active locks, pending transactions, and temporary tables to clear up. If a suitable time window appears, the patch is made in zero-downtime fashion. Application sessions are preserved and the database engine restarts while the patch is in progress, leading to a transient (5 second or so) drop in throughput. If no suitable time window becomes available, patching reverts to the standard behavior. 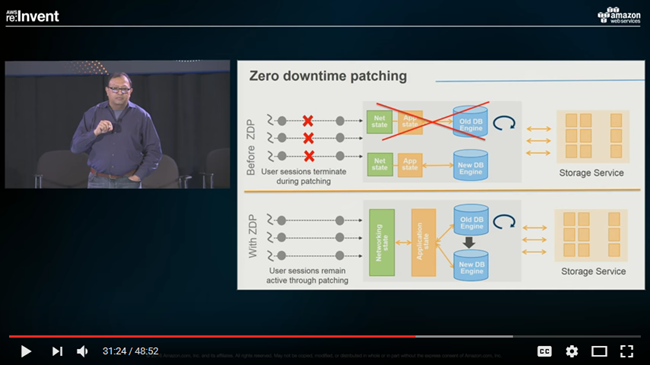 To learn more about how this works and how we implemented it, watch this segment of the Amazon Aurora Deep Dive video. These new features are available now and you can start using them today! 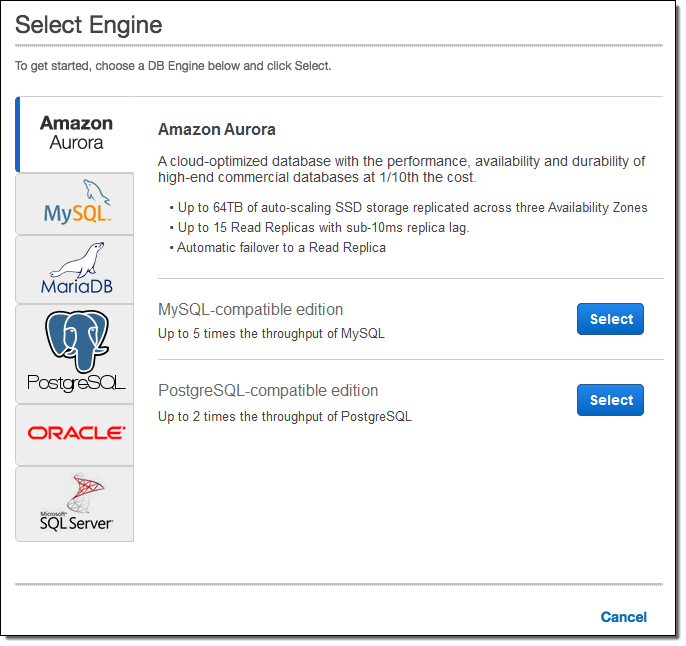 Just two years ago (it seems like yesterday), I introduced you to Amazon Aurora in my post Amazon Aurora – New Cost-Effective MySQL-Compatible Database Engine for Amazon RDS. In that post I told you how the RDS team took a fresh, unconstrained look at the relational database model and explained how they built a relational database for the cloud. The feedback that we have received from our customers since then has been heart-warming. Customers love the MySQL compatibility, the focus on high availability, and the built-in encryption. They count on the fact that Aurora is built around fault-tolerant, self-healing storage that allows them to scale from 10 GB all the way up to 64 TB without pre-provisioning. They know that Aurora makes six copies of their data across three Availability Zones and backs it up to Amazon Simple Storage Service (S3) without impacting performance or availability. As they scale, they know that they can create up to 15 low-latency read replicas that draw from common storage. To learn more about how our customers are using Aurora in world-scale production environments, take some time to read our Amazon Aurora Testimonials. October – Call Lambda Functions from Stored Procedures. October – Load Data from S3. September – Reader Endpoint for Load Balancing and Higher Availability. September – Parallel Read Ahead, Faster Indexing, NUMA Awareness. July – Create Cluster from MySQL Backup. June – Cross-Region Read Replicas. May – Cross-Account Snapshot Sharing. April – Cluster View in RDS Console. March – Additional Failover Control. March – Local Time Zone Support. March – Availability in Asia Pacific (Seoul). February – Availability in Asia Pacific (Sydney). In addition to the feature-level feedback, we received many requests for additional database compatibility. At the top of the list was compatibility with PostgreSQL. This open source database has been under continuous development for 20 years and has found a home in many enterprises and startups. Customers like the enterprise features (similar to those offered by SQL Server and Oracle), performance benefits, and the geospatial objects associated with PostgreSQL. They would love to have access to these capabilities while also taking advantage of all that Aurora has to offer. Performance – Aurora delivers up to 2x the performance of PostgreSQL running in traditional environments. 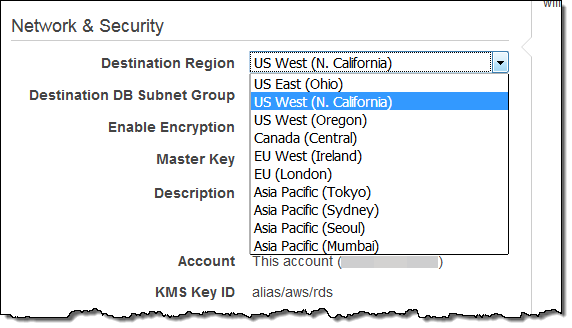 AWS Key Management Service (KMS) – Encryption at rest. AWS Identity and Access Management (IAM) – Fine-grained access control to Aurora APIs and resources. Amazon Simple Storage Service (S3) – Aurora backs up your database to Amazon S3 continuously, and uses it for almost instant recovery. Amazon Relational Database Service (RDS) – Provisioning, backup management, monitoring, scaling of compute resources, managing database configurations. AWS Database Migration Service – Easy migration from on-premises or EC2-hosted PostgreSQL, Oracle, or SQL Server. 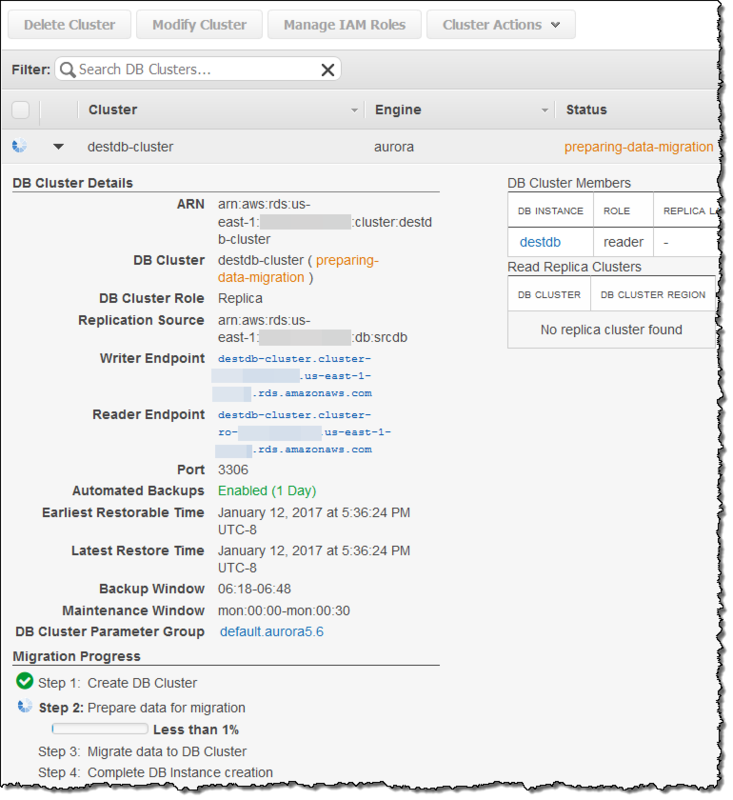 AWS Schema Conversion Tool – Easy conversion from one database schema to another as part of a migration. We are making a preview of PostgreSQL compatibility for Amazon Aurora available in the US East (Northern Virginia) Region today and you can sign up now for access! My colleagues David Wein and Grant McAlister ran some tests that compared the performance of PostgreSQL compatibility for Amazon Aurora against PostgreSQL 9.6.1. The database servers were run on m4.16xlarge instances and the test clients were run on c4.8xlarge instances. PostgreSQL was run using 45K of Provisioned IOPS storage consisting of three 15K IOPS EBS volumes striped into one logical volume, topped off with an ext4 file system. They enabled WAL compression and aggressive autovacuum, both of which improve the performance of PostgreSQL on the workloads that they tested. As you can see, Amazon Aurora delivered higher throughput than PostgreSQL, with about 1/3 of the jitter (standard deviations of 1395 TPS and 5081 TPS, respectively). David and Grant are now collecting data for a more detailed post that they plan to publish in early 2017. You will be able to access the new Performance Insights as part of the preview. I’ll have more details and a full tour later. Update! We have a webinar coming up on January 16th. Register for it here. Many AWS services work just fine by themselves, but even better together! This important aspect of our model allows you to select a single service, learn about it, get some experience with it, and then extend your span to other related services over time. On the other hand, opportunities to make the services work together are ever-present, and we have a number of them on our customer-driven roadmap. 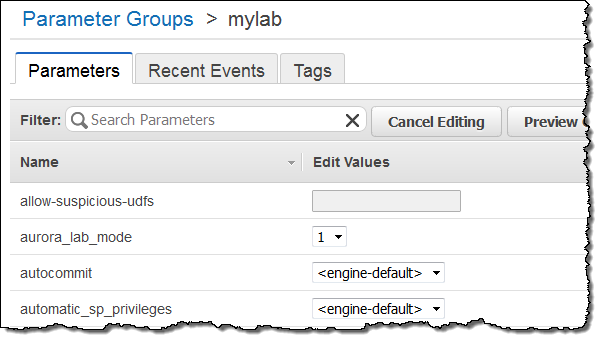 Lambda Function Invocation – The stored procedures that you create within your Amazon Aurora databases can now invoke AWS Lambda functions. Load Data From S3 – You can now import data stored in an Amazon Simple Storage Service (S3) bucket into a table in an Amazon Aurora database. Because both of these features involve Amazon Aurora and another AWS service, you must grant Amazon Aurora permission to access the service by creating an IAM Policy and an IAM Role, and then attaching the Role to your Amazon Aurora database cluster. To learn how to do this, see Authorizing Amazon Aurora to Access Other AWS Services On Your Behalf. Relational databases use a combination of triggers and stored procedures to enable the implementation of higher-level functionality. The triggers are activated before or after some operations of interest are performed on a particular database table. For example, because Amazon Aurora is compatible with MySQL, it supports triggers on the INSERT, UPDATE, and DELETE operations. Stored procedures are scripts that can be run in response to the activation of a trigger. You can now write stored procedures that invoke Lambda functions. This new extensibility mechanism allows you to wire your Aurora-based database to other AWS services. You can send email using Amazon Simple Email Service (SES), issue a notification using Amazon Simple Notification Service (SNS), insert publish metrics to Amazon CloudWatch, update a Amazon DynamoDB table, and more. At the appliction level, you can implement complex ETL jobs and workflows, track and audit actions on database tables, and perform advanced performance monitoring and analysis. Your stored procedure must call the mysql_lambda_async procedure. This procedure, as the name implies, invokes your desired Lambda function asynchronously, and does not wait for it to complete before proceeding. As usual, you will need to give your Lambda function permission to access any desired AWS services or resources. To learn more, read Invoking a Lambda Function from an Amazon Aurora DB Cluster. As another form of integration, data stored in an S3 bucket can now be imported directly in to Aurora (up until now you would have had to copy the data to an EC2 instance and import it from there). The data can be located in any AWS region that is accessible from your Amazon Aurora cluster and can be in text or XML form. To import data in text form, use the new LOAD DATA FROM S3 command. This command accepts many of the same options as MySQL’s LOAD DATA INFILE, but does not support compressed data. You can specify the line and field delimiters and the character set, and you can ignore any desired number of lines or rows at the start of the data. 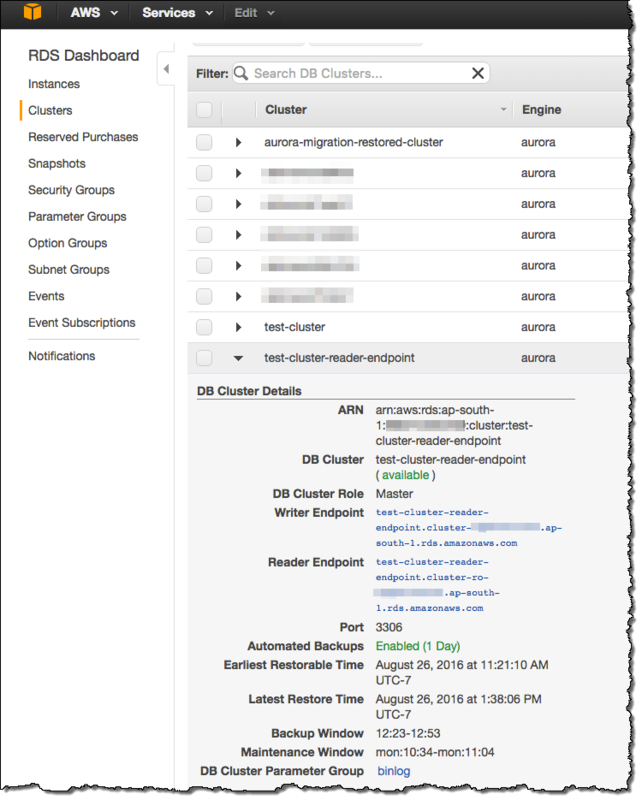 To learn more, read Loading Data Into a DB Cluster From Text Files in an Amazon S3 Bucket. There is no charge for either feature; you’ll pay the usual charges for the use of Amazon Aurora, Lambda, and S3. With MySQL compatibility “on top” and the unique, cloud-native Aurora architecture underneath, we have a lot of room to innovate. We can continue to make Aurora more efficient while still remaining compatible with all of those applications. Parallel Read Ahead – Range selects, full table scans, table alterations, and index generation are now up to 5x faster. Faster Index Build – Generation of indexes is now about 75% faster. NUMA-Aware Scheduling – When run on instances with more than one CPU chip, reads from the query cache and the buffer cache are faster, improving overall throughput by up to 10%. The InnoDB storage engine used by MySQL organizes table rows and the underlying storage (disk pages) using the index keys. This makes sequential scans over full tables fast and efficient for freshly created tables. However, as rows are updated, inserted, and deleted over time, the storage becomes fragmented, the pages are no longer physically sequential, and scans can slow down dramatically. InnoDB’s Linear Read Ahead feature attempts to deal with this fragmentation by bringing up to 64 pages in to memory before they are actually needed. While well-intentioned, this feature does not provide a meaningful performance improvement on enterprise-scale workloads. With today’s update, Aurora is now a lot smarter about handling this very common situation. When Aurora scans a table, it logically (as opposed to physically) identifies and then performs a parallel prefetch of the additional pages. The parallel prefetch takes advantage of Aurora’s replicated storage architecture (two copies in each of three Availability Zones) and helps to ensure that the pages in the database cache are relevant to the scan operation. As a result of this change, range selects, full table scans, the ALTER TABLE operation, and index generation are up to 5x faster than before. You will see the improved performance as soon as you upgrade to Aurora 1.7 (see below for more information). When you create a primary or secondary index on a table, the storage engine creates a tree structure that contains the new keys. This process entails a lot of top-down tree searching and plenty of page-splitting as the tree is restructured to accommodate more and more keys. Aurora now builds the trees in a bottom-up fashion, building the leaves first and then adding parent pages as needed. This reduces the amount of back-and-forth to storage, and also obviates the need to split pages since each page is filled once. On a db.r3.large instance, the time to run this query dropped from 67 minutes to 25 minutes. On a db.r3.8xlarge instance, the time dropped from 29 minutes to 11.5 minutes. The team is very interested in your feedback on this performance enhancement. Please feel free to post your observations in the Amazon RDS Forum. The largest DB Instance (db.r3.8xlarge) has two CPU chips and a feature commonly known as NUMA, short for Non-Uniform Memory Access. On systems of this type, each an equal fraction of main memory is directly and efficiently accessible to each CPU. The remaining memory is accessible via a somewhat less efficient cross-CPU access path. You will see the improved performance as soon as you upgrade to Aurora 1.7. Newly created DB Instances will run Aurora 1.7 automatically. For exiting DB Instances, you can choose to install the update immediately or during your next maintenance window.